« Zero Indian canteen operators allowed by racist UMNO to operate in any of the tens of thousands of national primary and secondary schools or any government department. RM 400 million for 64,000 skills training. But mere 0.1% to 1% Indian poor benefit. Because we are One Malay-sia? » UMNO racism and Interlok: Malay muslim students call Indian students keling paria but Indian students hauled to police station. Leading to Indian students beaten up. Zero school action or prosecution because victims are Indian poor. If the book is not withdrawn there are going to be fights like these in over 5,000 schools, leading to further gangsterism. SHAH ALAM: The parent of a secondary student expressed his disappointment with the principal who had allowed a racially tinged quarrel between schoolboys to get out of hand. Stephen Perumal Velu (left) said the problem ensued [on the morning of April 20] after a group of students had taunted the Indian boys with harsh and insulting words. He told the reporter when met at the school that he received a call from his son around 10.30am and had immediately rushed there. Stephen claimed that his son had recounted that the Malay students denigrated the Indian students by calling them ‘Keling Pariah’. At about 11am, a few police officers and parents were already gathered at the school front gate after being informed of the occurrence. Stephen said the principal handed over 26 students to be taken to the police station for questioning. It is reported that altogether 23 Indian and three Malay students had their statements recorded. “I’m very disappointed that my son and other students were taken to the police station when the real culprits who started the quarrel were let off the hook,” said Stephen. According to him, a school prefect had given the police a list of names of the students who were involved in the quarrel but these were not called up for investigation. An attempt by Free Malaysia Today to get the principal’s comments was unsuccessful. 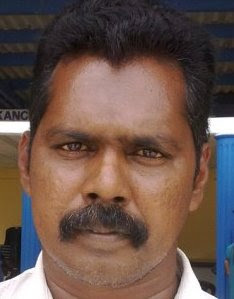 SHAH ALAM: The parents of a group of students who were taken to the Section 15 police station to give their statements on April 20 have still not received any clarification from the school principal, said their representative Stephen Perumal Velu. “We read a Bernama report that Assistant Commissioner of Police (Shah Alam) Zahedi Ayob had said that the case is reverted to the school authorities because the incident occurred within the school premises”. The report also quoted a source in the Selangor Education Department as saying, “the case is considered closed and the matter handed over to school to be resolved” and “the school administrators have informed [the department on the next day] that the parents of the students have been called for a discussion”. According to Stephen, what the school said is untrue as the parents were never called. “In fact, we went to the school on our own accord on April 21 and were disappointed with the attitude of the principal who washed her hands of the matter and tried to blame the police for hauling our children to the station”. “Not only had she neglected to inform us, she furthermore gave the excuse that the school did not have our contact details,” said Stephen when telephoned by the FMT reporter. Stephen said several parent were with him at the station on April 20 when the 23 students had their photographs taken and IC photostated by the police. He added that the students were traumatized by the experience, and he also feared that a stigma will be attached to them because they were treated like criminals by the principal. SHAH ALAM: About 50 parents assembled outside a secondary school in Section 25 here to protest the behaviour of the principal who denies that she had instructed 23 students to be detained by police. Spokesman for the group Stephen Perumal Velu said that by right the police could not detain their children without express permission from the principal. The gathering to demand the principal’s transfer lasted 20 minutes and ended upon negotiation with the police. Former PTA chairman A. Sivaprakasam who resigned his post last month told FMT that the discipline problem in the school had gotten worse. He said a number of teachers were also dissatisfied with the principal. “She’s a dictator”. Several calls by FMT to reach Megawati Hasbullah [the principal] were not answered. 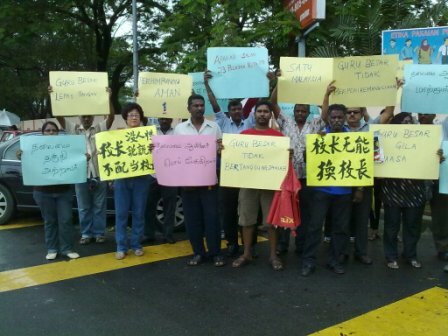 UMNO racism even against Indian poor kindly failure dialysis patients. But for the Malay muslim poor, Baitumal, Lembaga Urus Zakat and the scores of other Yayasan would bear the almost full cost.